Recently L has been asking to have a go on my violin and, as with too many requests, the answer is usually, ‘not right now’. So hooray for the summer break when there is less running about to various scheduled activities and more time for just trying things out. 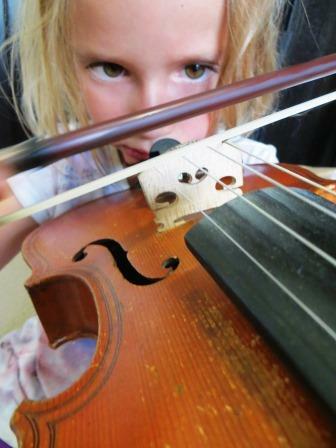 Six-year-old L grapples with a full-size violin. My violin is full-size and my L is… not so much. But she enjoyed having a go, and reminded me of the ear-assault that my own parents had to go through as I first started to play at around age 9. Thank goodness for patient parents though – learning the violin is a true gift, as of all the orchestral instruments it is probably the most likely to see you finding a place in an orchestra no matter your skill and experience. Do you have a musical instrument you’ve been meaning to let your child try out? Might the summer break be the time you find time? Or maybe you have a friendly local music shop or a kind friend who might let your child have a go (under supervision, of course). A project for another day is for me to track down somebody with an instrument that I’ve never tried to see if they will let me and/or my kids have a go. This entry was posted in Making Music with Children, Summer Camp 2015 and tagged Violin by Julia Andrews. Bookmark the permalink.